I really don't think I'll ever get over the heartbreak of Rescue Beauty Lounge shuttering its doors. I don't know how I'll be able to survive knowing there will never be new colors to fawn over with my best friend (who, coincidentally, is celebrating a birthday today!). 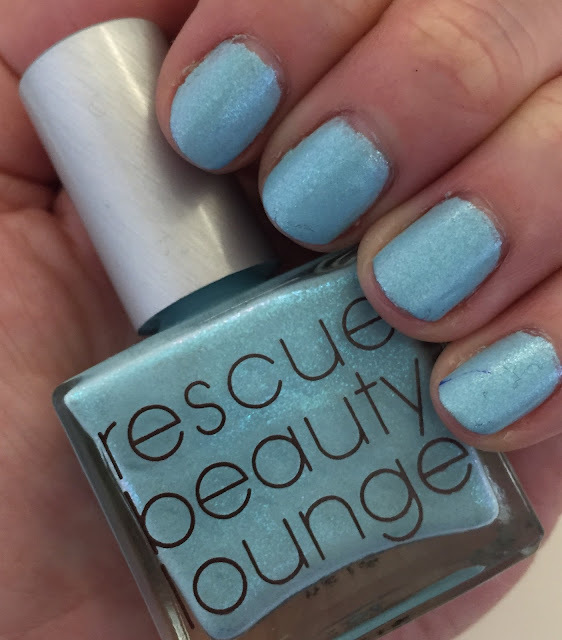 But I'm doing my best to move on, and today there was no better way to do that than with Rescue Beauty Lounge Electro Glacier. Electro Glacier was one of the colors from the Fan 3.0 Collection. The ice blue base has a crelly finish and is sprinkled throughout with beautiful turquoise shimmer. I know some other bloggers had problems with the formula, but I found that it applied perfectly opaque in two coats. I used very thin coats, though, so I didn't have any issues with application. Just. Look. At. That. Shimmer. This is definitely one of those shades that people can't help but notice. I've gotten so many compliments since I painted my nails this week! It's electrifying yet somehow muted. And, even though glaciers typically don't look this blue, it really does make you think of ice and winter (but in the best way -- or maybe I'm just saying that since I live in California now). Once again, Ji Baek knocked it out of the park. I'm definitely happy I added this color to my collection before RBL went away for good. Looks gorgeous! I'd love to see it up close! That is a super pretty polish! So sad when a beloved company shuts down :( This shade is super pretty though! Beautiful shade and the line is missed already. I'm wearing KBShimmer Coal in One and love love love it. Wow, this is such a gorgeous shade!